AISLE SAY San Francisco: Boxer in "The Royale' breaks race barrier, but at what cost? Boxer in "The Royale' breaks race barrier, but at what cost? Early in the 20th century, a black boxer became the heavyweight champion by defeating a white man. 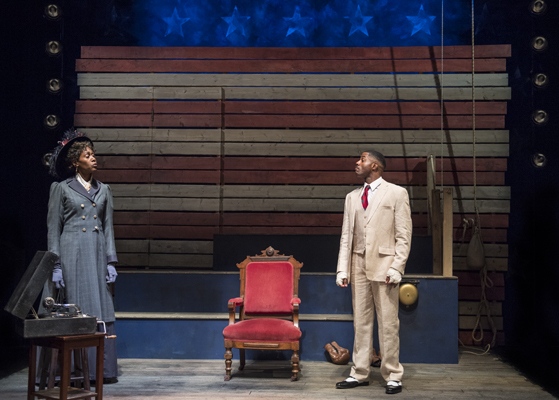 Presented by Aurora Theatre Company, “The Royale” is based on that black boxer, Jack Johnson. Here, though, playwright Marco Ramirez names him Jay Jackson (Calvin M. Thompson). The action begins with Jay fighting a boxer named Fish (Satchel André). They’re not hitting each other, though. They don’t even face each other. Instead, their moves are co-choreographed by director Darryl V. Jones and boxing coach Joe Orrach. Three people seated upstage stamp their feet and slap their knees to replicate the fight’s rhythms. Those people are Jay’s trainer, Wynton (Donald E. Lacy Jr.); his sister, Nina, (Atim Udoffia); and his white manager, Max (Tim Kniffin). Although Fish loses, Jay is so impressed that he asks him to become his sparring partner. After touring the country, winning fight after fight and bragging about his abilities, Jay wants to take on the recently retired champ. While the champ returns to form, their bout is highly touted, creating a national buzz. On the eve of the fight, Jay is confident, even cocky, until Nina shows up. She describes some of the abuses that blacks, even his young nephews, have already suffered at the hands of whites because of him. She warns that if he wins, violence will erupt in that Jim Crow era. Thus he’s torn between his desire to win and his fears about the aftermath if he does. Although the first scene seems prolonged, the rest of the play moves right along. Director Jones has elicited layered performances by all five actors. In one mesmerizing scene, Wynton, the trainer, describes fighting five other blacks when everyone was blindfolded. The last one standing picked up the coins tossed by white spectators in the venue called the Royale, hence the play’s title. The simple set is by Richard Olmsted with lighting by Kurt Landisman, sound by James Ard and costumes by Courtney Flores. Running a taut 90 minutes with no intermission, “The Royale” will continue through Dec. 3 at Aurora Theatre, 2081 Addison St., Berkeley. For tickets and information, call (510) 843-4822 or visit www.auroratheatre.org.